Since we have already committed to a theme this far, the dessert will be themed too, of course! We made cupcakes to make them easier for kids to eat and it gave us some freedom with the theme. Check out how much he loved it! Insead of Perils or regular sprinkles we used spinkles that were almost like glitter. TIP: Since you are only going to make about 6 of each character you DO NOT need a whole lot of each sprinkle color. We bought too much. Something like Wilton Jimmies 6 Mix Sprinkle Assortment would have been perfect. For the mouths, tongues and eye brows we used Wilton Sugar Sheets in red and black. They were easy to use. I just cut them with sissors to the shape I needed. TIP: Cover the whole cupcake with frosting, add the parts that need sugar sheets THEN add the sprinkles. 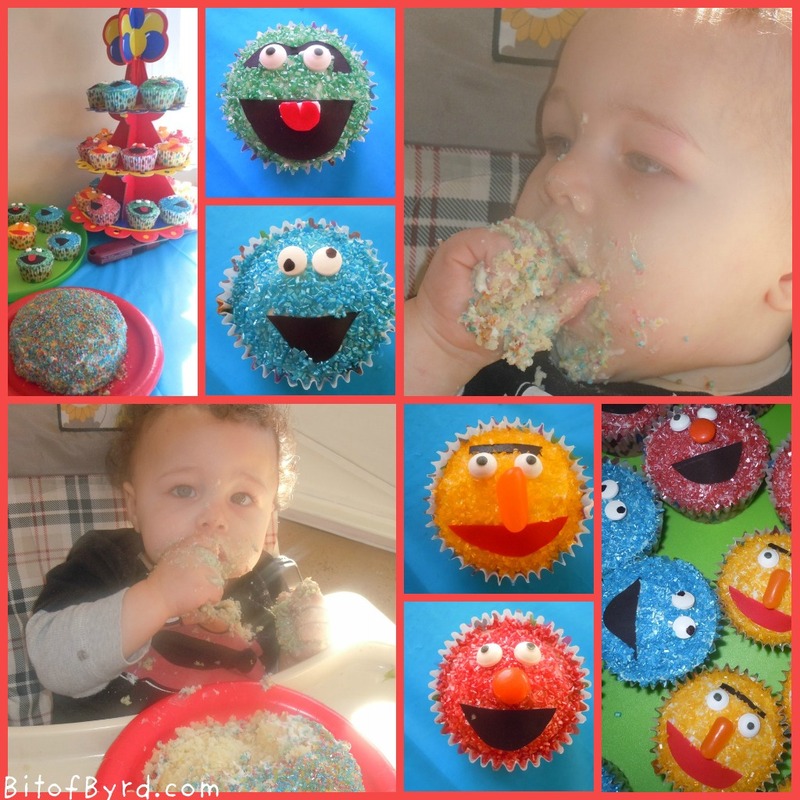 I put the sprinkles on with elmo first and the mouth didnt want to stick and it didnt lay flat. Elmo's nose is a reeces peices. Bert is a Mike and Ike. The eyes were Wilton Candy Eyeballs . For Cookie monster I used an Americolor Black Food Writer Marker on the back of the candy eyes to make them crazy eyes. For the smash cake I used a small cake pan I had and covered it with frosting and used all the sprinkles that were left on the cookie sheet to make a cake that was almost like confetti since it had ever color on it. Disclaimer: The links found in the post are affiliate links. By using these links to make purchases from Amazon you are supporting Bit of Byrd.